Kevin Coval brings his rapping alter ego from the page to the stage. 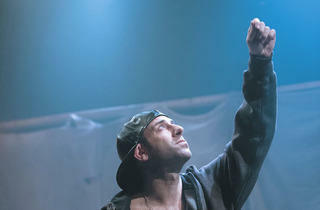 Photograph: courtesy of Victory Gardens Theater Kevin Coval in L-Vis Live! “There is nothing more gangster than taking a language you have no culture for,” rapper L-Vis says toward the end of his career. 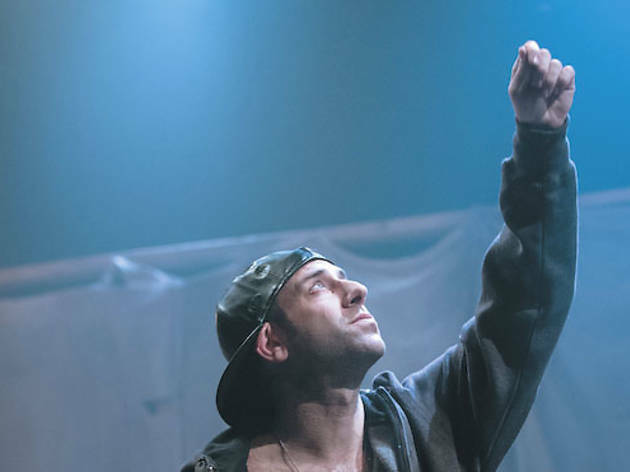 Over the course of this one-man show, presented as part of Victory Gardens’ Fresh Squeezed series, writer-performer Kevin Coval traces his character’s journey from his parents’ basement in the Chicago suburbs to hip-hop superstardom. Based on his 2011 book L-Vis Lives! : Racemusic Poems, Coval uses L-Vis’s story to look at the struggles of white artists to gain legitimacy in the hip-hop industry, from the Beastie Boys to Vanilla Ice to Eminem. L-Vis has a sense of humor about himself at the start, playing his whiteness for laughs as he attempts to break-dance or create a rap for his friend’s student-council election. As L-Vis’s fame grows, that humor becomes part of his problem, preventing him from establishing himself as a serious artist. Coval, cofounder and artistic director of the teen poetry festival Louder than a Bomb, has a smooth flow and quick tongue that bring a crackling energy to his hip-hop-inspired verse. Jess McLeod’s active staging keeps Coval moving so that the visuals are as fluid as the language. At less than an hour, the play has room to expand. L-Vis’s climb to the top is chronicled in depth, but his later downward spiral and conversion to Islam happen so quickly that their impact isn’t fully felt.